Greetings to all of you Auduboners out there. As we close out the calendar year, I thought I'd briefly recall a few of the activities enjoyed by Pearson Audubon members his year. We had a variety of interesting and informative monthly programs, most recently when we hosted Tom Earnhardt, who drew our largest crowd in memory, more than 80 participants. Our Second Sunday Nature Walks continue to be successful, most recently when we visited the A&Y Greenway. We have been involved with the Bird Friendly Communities project in a number of ways, helping to plant native species along both the Greensboro Downtown and High Point greenways. Signs identifying native plants at the Audubon Natural Area have recently been installed, and a workday to remove some of the non-native species invading that area was held in early November. We will continue our Brown-headed Nuthatch nest box program while working to help this year's Bird of the Year, the Chimney Swift. Our Swifts Night Out social and roosting watch was a big success and a lot of fun. We'll enhance the Chimney Swift project in the coming year. Meanwhile, our best for the holidays and the new year. Lynn Moseley gave two programs recently on behalf of Audubon NC at the North Carolina Botanical Garden as part of their "Saving Our Birds" series. On Oct.13, she presented a talk on "How to Bird-Proof Your Windows." About 37 people attended. It was a very interactive session, with many questions and good suggestions from the audience. 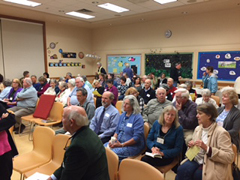 On Nov. 10, Lynn also gave a talk on the Brown-headed Nuthatch to an audience of more than 40 people. Barbara Driscoll from New Hope Audubon sold three nuthatch boxes, and Lynn gave away 15 sets of excluders and brass screws to adapt bluebird boxes for Brown-headed Nuthatches. Give a big welcome to our new web coordinator and newest board member, Leigh Clodfelter. She is a full-time zoo keeper at the North Carolina Zoo in Asheboro. Working at the Rocky Coast section of the zoo, her primary responsibilities are providing husbandry, enrichment, and training for the seabirds and one Peregrine Falcon. Prior to becoming a zoo keeper she worked as a designer providing 2D/3D animation, video editing, web and graphic design for her employers. Leigh also volunteers with Wildlife Rehab, Inc. of Winston-Salem, helping feed the education raptors a couple of times a month as well as going out with these birds and other volunteers for programs/events. She is married with one daughter. and she has one dog and four cats. She loves the beach—and birds, of course. On the morning of Wednesday, Dec. 9, thirteen environmental warriors were mustered on the battlefield of the Audubon Natural Area. Our general, Ken Bridle from Piedmont Land Conservancy and his attaché, Lynn Mosley, outlined the battle plan and distributed our weapons: loppers, choppers, saws, and an ingenious herbicide delivery system. Our enemy: invasive plants. We split into teams of three and set out. We had a very productive couple of hours as we cut stems, painted the remainder with herbicide, and hauled away the dismembered parts to create brush piles. Many thanks to Sue Cole, Jim Eldrett, David Farrier, Lynn Allison, Linda Hayes, Diane Laslie, Lynn Moseley, Deborah Staves, Ann Walter-Fromson, Stella Wear, Tom Wear, Judy West, and Ken Bridle, who brought the tools and provided much help with plant identification. 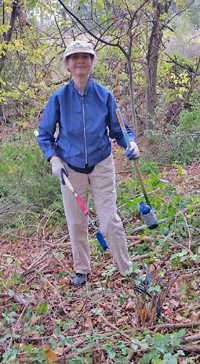 Sue Cole and Judy West planted 25 Christmas Ferns in the Natural Area. The ferns had been rescued from an area scheduled for development in Chatham County. Sue and Jim returned the next day with jugs of water and watered all of the ferns. Jack Jezorek, currently on inactive duty, arrived to survey the damage and provide moral support. I think everyone came away feeling a sense of satisfaction with a job well done with folks of like mind. There is much more work to be done, so look for announcements of more workdays in the months to come. 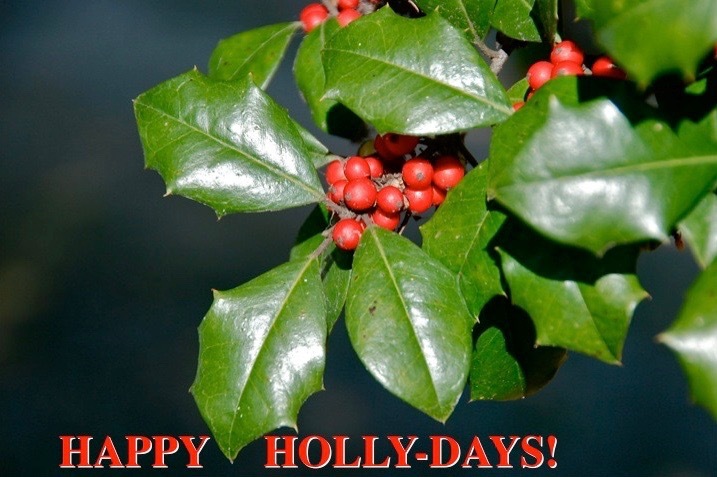 Join us on Thursday, Dec. 8, for nature photos and delicious holiday desserts and beverages to start this festive season with fellowship and calories. Our social committee will provide the food, and those clever members who can take beautiful pictures will provide the entertainment. This program always is a great hit for our holiday gathering. For this to happen, though, we need your photos! Here’s all you have to do: Select a batch of your nature photos from 2016 and share with us what you’ve seen. Not many of our members are professional photographers so don't worry if Audubon Magazine hasn’t been knocking on your door for your photos. Amateurs are welcome. We just want to see what natural wonders you’ve seen this year. Topics can be just about anything in nature such as birds, butterflies and other insects, native wildflowers, beautiful scenery, rock formations, weather events, and so on. Use your imagination. We also will welcome photos of members enjoying Audubon activities like field trips, Second Sunday Nature Walks, Audubon Natural Area maintenance days, and our Earth Day celebration. No general travel and family photos, please, but you don’t have to limit yourself to local photos. You can show us what nature you saw on vacation! You can bring as few as you like up to about two dozen. Be sure to bring them on a flash drive (thumb drive or “memory stick”). We cannot accommodate on-line photos, CDs & DVDs, or switching between our computer and your computer. RSVP: Please let our photo show coordinator, Dennis Burnette, deburnette@triad.rr.com, know how many photos you plan to bring by Tuesday evening, Dec. 6, so that we can plan how to organize our great evening of photos. You’re invited to join Audubon members for a trip to the site of a famous Revolutionary War battle. 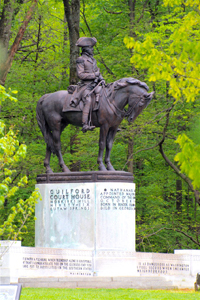 In March of 1781, Major General Nathanael Greene’s troops fought the English Lieutenant General Cornwallis near Guilford Courthouse. Although the American colonists were defeated, they inflicted so much damage to the British troops that, seven months later, the weakened force was unable to withstand General George Washington’s army at Yorktown. In addition to its important historical significance, the park contains a variety of habitats that provide homes for wildlife and native plants. Well-maintained paths take us through open fields, hardwood forests, and stands of pines. Bring binoculars to spot the many species of birds that can be found in the park. To carpool, meet in front of Whole Foods at Friendly Center beneath the Sears sign facing Friendly Avenue so that we can leave by 2 p.m. If you want to meet at the site, gather in front of the Visitors Center by 2:15 p.m. The National Audubon Society's Christmas Bird Count, an event many birders look forward to all year, is this month! Nationally, Audubon has set the count period as Wednesday, Dec. 14, 2016, through Thursday, Jan. 5, 2017. Many years ago, before there was an Audubon chapter in our area, the Piedmont Bird Club (PBC) began sponsoring the count locally. PBC will conduct Audubon’s 117th annual Christmas Bird Count in Guilford County on Saturday, Dec. 17. Many members of our Audubon chapter will participate. The Christmas Bird Count (CBC) is a long-standing program of the National Audubon Society, with well over 100 years of citizen science involvement. Thousands of volunteers across the US, Canada and many countries in the Western Hemisphere, go out over a 24-hour period on one calendar day within the count period to count birds. Some teams need new counters for all or part of the day, and beginning birders are welcome. There will be at least one experienced birder on the team. Some teams conduct the count mostly riding through the territory, while others do the count mostly walking…or a combination of approaches. It depends on the team assignment. It’s wise to dress in layers for the weather. If you have them, bring binoculars and a field guide. You also may want to bring a snack and something to drink, maybe even a hot beverage. For more information or to sign up for the CBC, contact PBC’s Elizabeth Link, 336-273-4672, elizlink04@gmail.com. 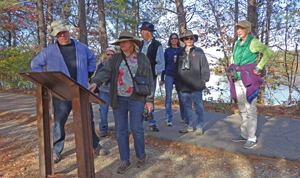 On Sunday, Nov. 13, eight people strolled along the A&Y Greenway from Bur-Mil Park south to the Weaver Bridges for Pearson Audubon's monthly Second Sunday Nature Walk. The fall colors were a beautiful sight along the shores of Lake Brandt. From the bridges, participants saw Great Bue Herons, Mallards, Buffleheads and a Belted Kingfisher. Along the walk they also heard Brown-headed Nuthatches, which is not a surprise because pine trees surrounded the trail. 170 species that breed, nest, migrate or winter in North Carolina are at risk. You can help these birds survive by supporting programs right here in North Carolina. Brown-headed Nuthatches, American Oystercatchers, Golden-winged Warblers and hundreds of other species need your help. There are many ways you can help birds throughout North Carolina. Audubon North Carolina's goal this year is to raise $50,000 by Dec. 31, 2016, to further the work needed to protect North Carolina’s birds in the coming year. To learn more and to donate, click here. Or, mail a check to Audubon North Carolina, 400 Silver Cedar Court, Suite 240, Chapel Hill, NC 27514. To give to our T. Gilbert Pearson Audubon chapter, maill a check to TGPAS, P.O. Box 10157, Greensboro, NC 27404. All donations support the conservation of birds and bird habitat at local, state, and national levels. And all donations are tax deductible – something many people think about at the end of the year before tax season approaches.